How would a clean independent source of free renewable energy change the lives of a community of people living in an underdeveloped area? When hydroelectric power is mentioned, most people think of gigantic dam systems, which cost billions of dollars, take years to build, destroy ecosystems and aquatic life, and are controlled by a centralized power system which controls and distributes the electricity produced. 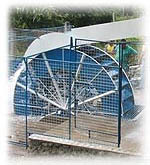 An option most people do not consider are mini-hydroelectric systems. These may be ideal for undeveloped areas and even developed areas. Some of their advantages are low cost, local ownership and control, energy independence, ease of installation, and lack of environmental impact. GG Energy plans to build and deploy mini-hydro systems for quick emplacement into undeveloped rivers and streams, aimed at sites distant from the electrical grid, or when back-up power options are desired. We also have plans to convert the two rivers running through downtown Loja, Ecuador into electricity production. Development of another system of quick deployment pedestal-contained generators may be developed to harvest the flow of large rivers, such as the Amazon, without significant ecological impact. These may be used for power generation and for hydrogen fuel production, to convert local boat traffic from fossil fuels to renewable energy. The RotoVerter technologies can will make these generators much more efficient than previous models, thus making them more economically viable. FTW efforts help teach vocational skills to socially excluded people in Morocco and more!